The Poke feature of Facebook has been around since near the start of Facebook. You can ‘poke’ someone like a tap on their shoulder as you walk down the hall. They have shared a brief second with you and time moves on. Why, well… not sure beyond letting someone know your thinking about them. 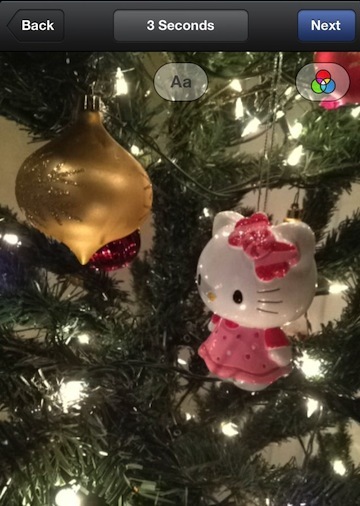 An app, ‘Snapchat’ took that a step further by letting you remind them that your thinking of them with a photo. Instead of just sending a text message with a photo attached, you can use the app which will limit the length of time the photo will be viewable. Perhaps it could be used to show someone a interesting thing that is happening without worrying about the photo being shared or cluttering up the recipient’s iPhone photo library. 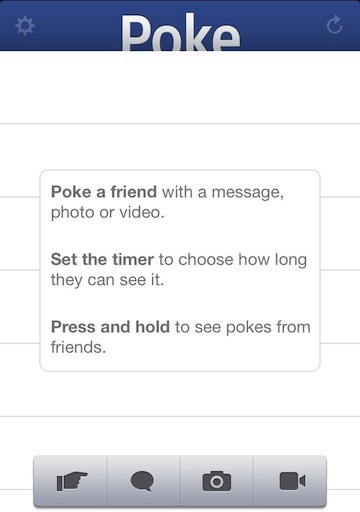 Facebook has taken their Poke feature and made it into a free iPhone app now. 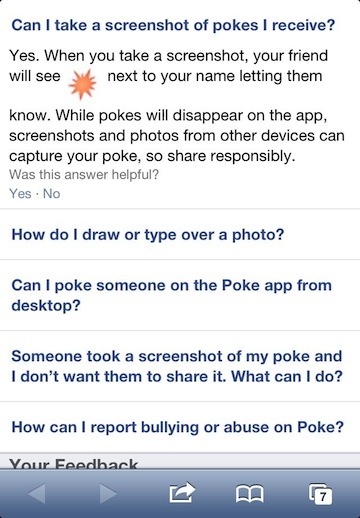 You can choose to ‘poke’ someone, you can send them a photo, a bit of text or even a short video. All will be viewable for the receiving person (Facebook contact) for how long you allow and then go away. After you choose the type of ‘Poke’ you wish to send, like the photo below, you can do a little tuning and set how long the photo will be viewable to the person your sending it to. When you tap ‘Next’, you are presented with a lit of folks your connected to on Facebook allowing for one or many to be chosen. After you send, the Poke and who you sent it to is added to your list of ‘sent’. The list can be cleared if you do not want the history kept. But, if someone was fast when their view a photo you send them with Poke, why couldn’t they just take a screen capture of the image. According to the ‘Help’ area, the sender gets a message that a screen capture was snapped. Of course, there are apps that record all actions when an app is open so that wouldn’t register as a screenshot. Also, they could snap a photo of the iPhone screen using a second device so don’t be misguided into sending something that could haunt you later thinking it will go away forever when Poke auto deletes.